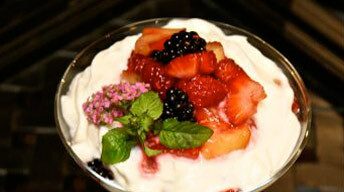 Toss the berries with the sparking wine and ¼ cup of sugar (sliced if using strawberries or nectarine). Marinate for 1 hour. After preparing all the ingredients, thinly slice the pound cake. Pour approximately 2 oz of crème anglaise in the bottom of the loaf pan. Then layer ¼ of the pound cake slices to cover the bottom of the pan. Add 2 oz of the berry coulis, and 1/3 of the berries or fruit slices. Top with ¼ of the whipped cream. Continue layering until there are four layers of pound cake. On the last layer top with coulis and whipped cream only. Cover and chill until completely set, about two to four hours. To serve, ladle some of the crème anglaise on the plate and spoon a serving on top. Garnish with shaved white chocolate and fresh mint sprig. Drizzle a little of the berry coulis around the trifle for colorful finish. Marinate the berries with the sparkling wine for 1 hour. Puree berries, wine, and sugar in a blender. Strain through a fine mesh strainer and place berry puree in a saucepan. Combine the cornstarch and water, mix until the cornstarch is dissolved. Bring the puree to a rolling boil and add the cornstarch. Boil for one minute, until the puree thickens. Remove from the heat and cool over a bowl of ice water, stirring occasionally. Separate eggs, placing the yolks in a small bowl. Heat the half and half and sugar over medium high heat until it comes to a boil. Slowly pour the half and half into the beaten egg yolks and then return the mixture to the saucepan. Stir the sauce constantly over medium heat until it thickens enough to coat the back of the spoon. Remove from heat, add the vanilla and pour through a fine mesh strainer into a bowl over ice. Stir frequently until mixture is cool. Refrigerate until ready for use. For a winter version, leave out the sparkling wine and substitute poached pears, caramel sauce, crème anglaise and chocolate sauce and top with some chopped toasted hazelnuts. Or use sweetened cranberry sauce, orange segments, crème anglaise, and pistachios. Or even make a tropical version, using tropical fruits use some coconut milk and rum in the crème anglaise.